I live on the top floor of a high rise with a great view of my city. I plan to place both the ferrite antennas & E-probe on the balconny. However, living as I do, I assume there is plenty of sources of interference coming from lower floors. Question: is it possible to build a shielding around the probe in the (potentially) offending sectors? (2017-04-22, 14:54)Max_Headroom Wrote: Gentlemen & members! The Electromagnetic impulses consist of two fields... magnetic and electric. 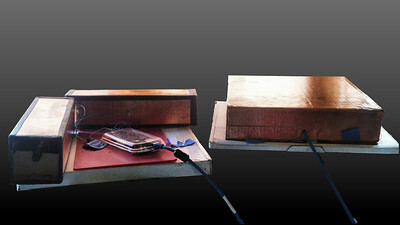 The ferrites receive magnetic energy, the E probe receives electrical. The H field antennas are also susceptible to some types of electrical signals. If we don't want Electiric energy in the ferrites, we can shield them... electrically conductive material can be wrapped around the loops, except for a gap the length of the shield... (if the shield were continuous, it would be 'shorted out'... and nothing would get to the antenna.).. the shield is then connected to ground, and a large percentage of any 'electrical' interference would be eliminated. The desired magnetic portion would then be allowed to reach the antenna. The E probe is designed to detect the electrical energy of the impulses. If you shield it, you short that to ground. Therefore the E probe is not to be shielded. By it's nature, it is relatively immune to the magnetic portion. 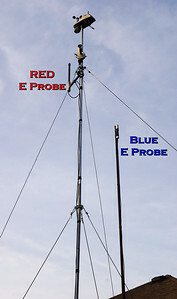 If you read the documentation, the E probe needs to be outside, away from any structures or noise sources, at least 2-3 meters or higher above ground. The air space between the probe and earth is an integral part of the probe. antennas, on the left. The 'box' version is not quite as effective. the E field will be well behaved. Cutty, many tnx for your post. A lot is clearer now. My current plans is to shield the ferries in opened-up copper pipes. Reading about this shielding, states that you need to have a distance between the copper & ferrites, to avoid "magnetic vortice effect"? Any thoughts of optimum distance, or just simply "more is better"? 1) Is 100 mm correct? 3) The gap distance shown is 2-4 mm... That's a pretty big range... What is the theory behind sizing the gap? Would it be based on the frequency and polarization of the "noise" vs. "desired" signal? 3a) Does the gap function as an admission aperture? 4) How should the gap be oriented? Does it matter? Say a ferrite that is long axis oriented E/W to generally receive N/S signals.... Gap Up? Down? North? South? 4a) Would there be any benefit (on horizontally oriented ferrites rcving vert polarized sigs) to having TWO gaps oriented in the 2 cardinal directions the ferrite favors? (Of course, you'd need to bong GND to both halves, or bond the halves together at both ends on the "far side". 5) When using the third ferrite oriented vertically, which would favor receiving horizontally polarized signals, how would you orient the gap? How many gaps? 1, 2, 4? Intuitively, I'm lead toward 4 as a minimum... oriented N,S,E,W... Or 6, oriented every 60 degrees.... Or 8, every 45.... How many gaps before the shield is rendered less than useful. Crap.... it just occurred to me that I am too ignorant of the basics in this particular subject to converse intelligently about shield theory, design, optimization for H-filed ferrite antennas. (2017-10-15, 17:42)KY5G Wrote: Crap.... it just occurred to me that I am too ignorant of the basics in this particular subject to converse intelligently about shield theory, design, optimization for H-filed ferrite antennas. Hi KY5G, Join the club! Happy reading. with very little E noise. The Pesky was tried for one specific electric troublemaker, and it worked, where other approaches and types did not. 1. 10 X Diameter of the Core is the WIDTH of a Side... The Antenna is centered inside, so there would be 37.5MM from core center to side. Don't ask me why. There's probably some math to compute, but this is what the Engineers told us to use on that ECM COMM gadget. 2 Any thin gap width would probably work. My notes specified 2-4mm for the project we were working on at the time... some engineer said it., and it was in the L and S communications bands. 3. All kinds of shielding approaches.... First Question: If you don't have electrical interference being picked up by the H field antenna's you probably don't need any???? 4. Gap runs along axis of rod. 4a. Not on a ferrite core... nothing works for me for H polarized in my environment,. 5. Only need one gap if you need any shielding at all. the gap is to keep from 'shorting' the shield, and possibly degrading reception. Re: "Crap" ... How do you reckon the rest of us learned anything? Ask away! If we don't know the answer, we'll invent something, maybe. 1. OK.... The math for the figures you just gave me doesn't work out right.... The prototype was 75mm width on a 7.5mm core.... (75mm - 7.5mm)/2 = 33.75mm minimum free space between surface of core and closest approach of square tube surround. Not sure where the 5mm spacing comes in... Since it doesn't seem to be a critical dimension, I am going to use non-conductive tubing with an outside diameter closest to 100mm or so... That will put the copper shield approx. 45 mm spacing from the 10mm core. 3. Don't KNOW if I will or not... But I plan to put this H-field 3-axis antenna up near the top of a 38 foot mast, and even if I DON'T have trouble today (and I likely will.... it's noisy here), I may have it down the road and don't want to have to pull it down to add the shielding. 4. Understand now what it is ans why it's there... Under our general circumstances, only one continuous gap/aperature is required and orientation makes little difference at the frequencies under consideration... especially since I ALSO have all 4 LPF installed. "Crap" ---- Thank you! You are very kind. Note: I intend to test the addition of screen "caps" top and bottom, but will leave gaps as required and bond the caps to the cylinder shield as required to shield but not short the element reception... Don't think the end-firing area is likely much of a concern, but you never know.... Will be doing the testing at 8 foot level to avoid pulling the mast with my GPS antenna and third leg of 80m delta loop hoist rope/pully attached. Also considering adding the "CSS Thingy" wrap and disc(s) too... why not try it.... 1) Un-shielded, 2) Shielded 3) Shielded, just CSS thingy wrap 4) Shielded, just CSS disc(s), and finally 5) Shielded, BOTH CSS Thingy wrap AND disc(s). Something to do anyway... and a spreadsheet of empirical data to share. 1. 10 X Diameter of the Core is the WIDTH of a Side... The Antenna is centered inside, so there would be 5MM from core center to side. Don't ask me why. There's probably some math to compute, but this is what the Engineers told us to use on that ECM COMM gadget. You're correct.... the 5mm is a typo... should be 37.5 mm from rod center.... The width of a 'side' would be 10 times the core's diameter, and the core is centered insite the 'box' axially. So a 10 mm core would have 100mm sides.. Windings don't count. just Core material. (2017-10-16, 23:34)Cutty Wrote: You're correct.... the 5mm is a typo... should be 37.5 mm from rod center.... The width of a 'side' would be 10 times the core's diameter, and the core is centered insite the 'box' axially. So a 10 mm core would have 100mm sides.. Windings don't count. just Core material. Still working on the e-field housing. Haven't decided if I will use external copper foil over PVC or similar yet... but I'll post up when I'm done. Thank you... I read that thread, but lost it and couldn't find it again. The ribbon cable thing is intriguing to me having worked with it a LOT a couple decades ago when coming up with workable designs for round IDE cables WELL in excess of the then 18-24" max length standard. Probably will choose whichever turns out to be cheapest and presents the smalllest flat plate wind load. The 38 foot mast is getting pretty well populated up top.